You can’t really wrap gift cards, but that doesn’t mean you can’t offer them in a fun and cute way! 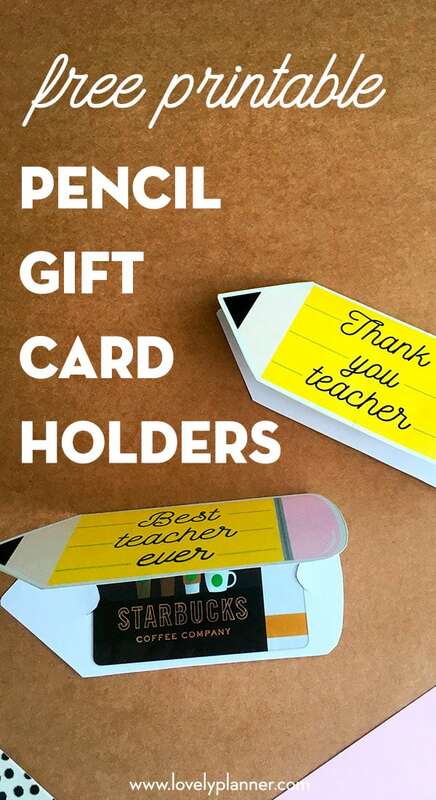 Gift cards make a great and easy gift for teachers so I’m happy to share two fun pencil teacher appreciation gift card holders. If you’re looking for teacher appreication day gift ideas, look no further. Gift cards are the best way to make sure your gift will actually be used and that the recipient will get what pleases him the most. 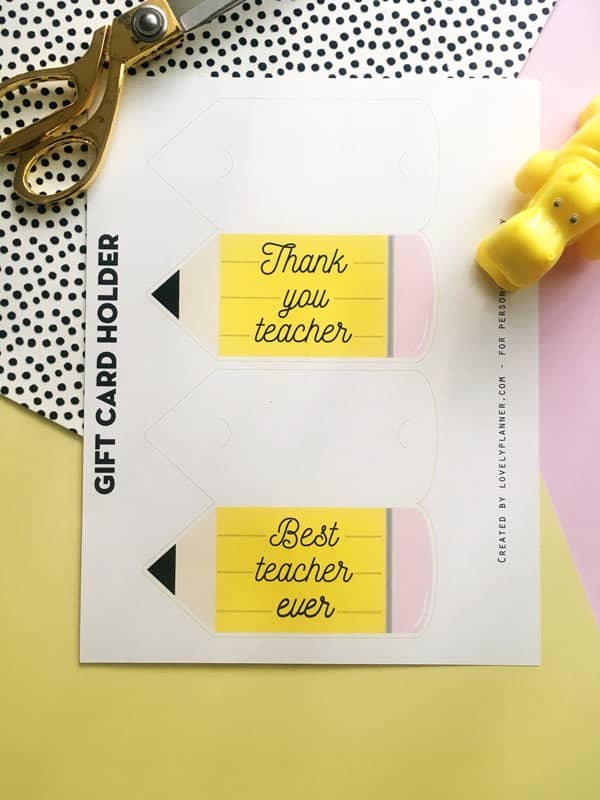 So, if you’re planning on offering some gift cards to your children teachers, I created the perfect gift card holders to make sure you add that extra cute touch to them and make them more fun to give. 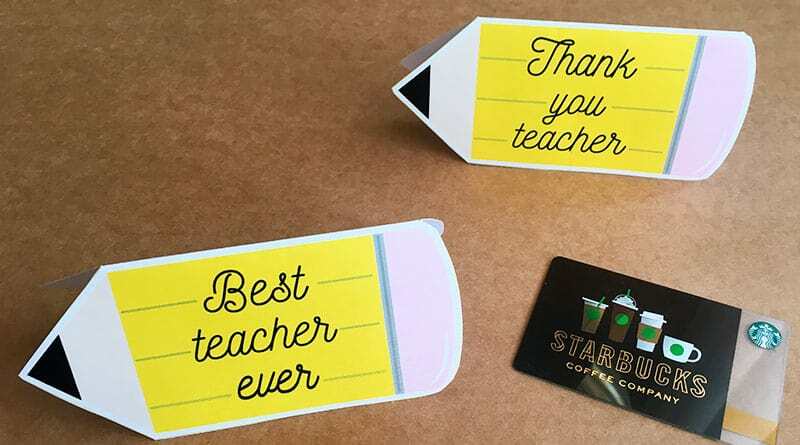 These free printable teacher gift card holders are foldable cards made in the shape of a pencil. 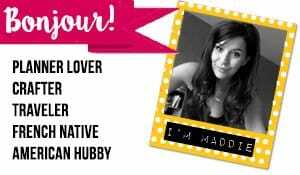 I included 2 different sayings: “Best Teacher Ever” and “Thank You Teacher”. Both designs fit on one page. Simply print it (scale 100%), cut around the outline, fold it in the middle and cut the slots to place your gift card inside. You’ll end up with a cute pencil shaped card. I’ve included little cutting marks on the back of the pencil to show where you can cut (use an Xacto knife) to easily and securely slide your gift card in there. You could also add your name and the recipients name on the back of the card (“to” and “from” spaces) or you could even add a message inside to make it more personal.